Few of you know that the reason I ended up living in London these past nineteen years is because of my mum’s love of British style. As a passionate seamstress, she scoured Sunday markets to find beautiful tartans from Scotland and cotton fabrics to make Elodie and I, pretty smock dresses in Summertime and dresses and jackets out of tweed, tartan and wool fabrics in Wintertime. The truth to be told, I wore tartan kilts and leather navy mocassins until I was about 13 years old and I still love wearing a tartan shirt over boyfriend jeans so when the ScotlandShop contacted me to feature their products, I thought it would be a great tribute to these childhood years that very much shaped my love for Great Britain and I know that those of you who love sewing, will be delighted to discover where they can source and order real tartans made in Scotland. If you look on Pinterest, you will find a lot of examples of interiors using tartan but while I love the fabric, the style featured is often too classical for me so today, I’m showing you two modern rooms you can decorate with tartan without overpowering your home. First, I style the lounge in this house. Having recently added a lovely grey sofa, I opted for tartan cushion covers that would match the sofa’s fabric. The ScotlandShop has over 500 tartans and tweeds to choose from so there are a lot of creative opportunities but I’ve always been very fond of the Black Watch Modern tartan (navy/green) and the Gordon Dress Modern tartan (green/white/yellow). I also ordered a super soft Black Watch Modern tartan throw in brushed wool will be great to have around the house or in the car to wrap ourselves up. Tip to decorate with tartan: The key to use these beautiful fabrics is is to use colours that complement each other and match your furniture. 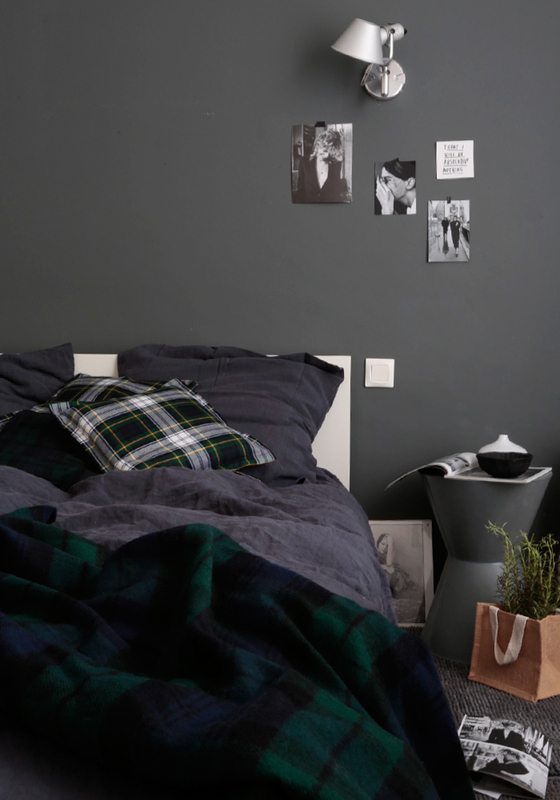 In the bedroom, those tartan cushions work wonder against the back wall painted in Down Pipe by Farrow & Ball and dark grey stonewashed linen sheets, adding some interesting patterns to the room and a traditional touch without being over the top. The perfect combo for a cosy weekend at home. The ScotlandShop has also some great accessories like this messenger bag that Mila loves and some beautiful tartan stoles. Have you used tartan in your home before? A whole article in itself but I would also love to know if something your parents were passionate about when you were a child, had a positive influence on the choice you made later on with your life. Disclaimer: This post is sponsored by ScotlandShop. Thank you for supporting the sponsors that make the BODIE and FOU blog possible. nice photos. i love the gray wall. with affection from siena, italy.